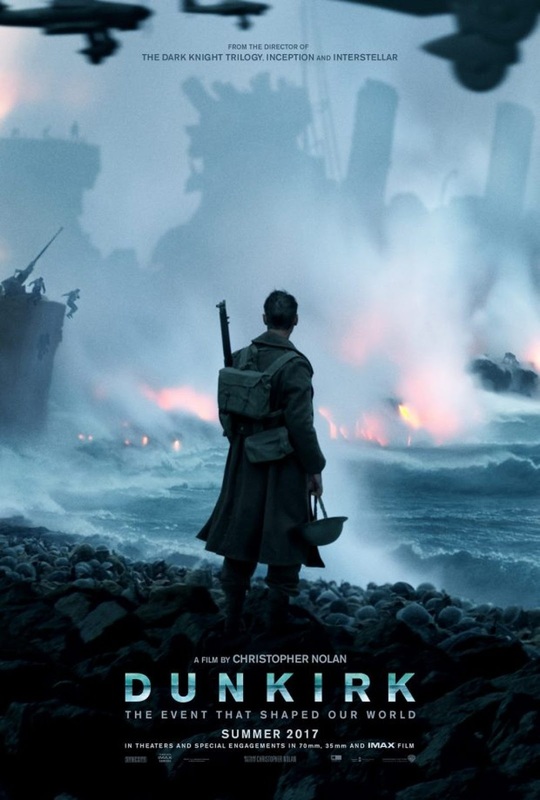 Christopher Nolan has delivered on all the promise and build up that has been brewing over his war epic. Dunkirk is one of those films that is an outstanding experience for audiences. He breaks all the rules about films are supposed to be made, about how war films specifically are to be made, and he shows us why by bringing us a masterful film. One of the great successes of Dunkirk is how economical Nolan is. There is no "filler" in this story. He doesn't do the typical structure when making a film about a historical event. Normally we see a build up to that event through setting out location, seeing who the major players are (and often then telegraphing how they are going to end up), and slowly building the tension until the event happens. Instead Nolan plays with time and character creation by just flat out telling us and it works. Then he drops us right in the heart of the action right away and for his surprisingly short running time just leaves us in it. And all of this gives us a visceral experience which is very much unlike your typical war movie, and perhaps much more stunning. War films face a particular challenge in the age when the majority of western audiences haven't experienced war. Achieving any sense of reality is difficult for audiences who have no idea. Many films, quite rightly, shove the violence and horror down our throats. War is hell and we should see that, not some glorified justification for the deaths of hundreds, thousand of people that help us sleep at night. However Nolan here takes a different path. His characters face death and violence and horror but he doesn't dwell on any of it. He makes us feel it richly but doesn't drown us in it. Through his interweaving stories he manages in his relatively short time to make us feel it all. Another thing that sets Dunkirk apart from the average war film is how it inverts the genre's general trope. This is a film about survival not about killing. It's about enduring not winning. Dunkirk doesn't fall into the traps of needing to triumph over evil, the general excuse we use for war. Instead it is about showing what it is like to live. And his film ends as abruptly as it started. It doesn't proselytize. It just brings some of the boys home. Dunkirk feels like a slice of life, but in the midst of death. From its radically different structure to its hauntingly beautiful cinematography which reminds you why we see films on a big screen, Dunkirk is a wholly original and incredible film. I maintain one piece of criticism. Nolan chooses purposefully to tell only a white male point of view and I think that's a mistake. There are those who jump through hoops to justify this by trying to bend history to argue that no women or people of colour were a part of this event (which isn't true) or to minimize their presence contribution. And this is why it's a mistake. Every experience is valid, including the point of view of the majority of soldiers involved who were white British men. But when the passion to continue to exclude the experience of the rest is still so vividly powerful, choosing to leave out those voices is a way of justifying that passion. For me the movie would have been stronger to see a more complete experience of Dunkirk. But that doesn't mean that Dunkirk isn't still one of the best films you can see all year. And it certainly doesn't mean you shouldn't ensure you see this on a big screen where it can be fully appreciated. Dunkirk shows the work of an artist at the top of his game, at the top of his craft.